Trendtrader system found at trend-trader.net promises you a free money making system that is guaranteed to make profit. Is it too good to be true? More importantly, is Trendtrader a scam? Let’s find out in our in-depth Trendtrader review. Is there really no risk trading with Trendtrader system? Trendtrader scam (yes, it is a scam) is one of the more well-made binary trading software scams out there. The sales material doesn’t appear to be too scammy and overly hyped. The website presentation and sales video seem professional and carefully crafted. Even so, there are some red flags that you should be aware of when it comes to Trendtrader scam. The first one is the unsubstantiated headline used in their homepage. 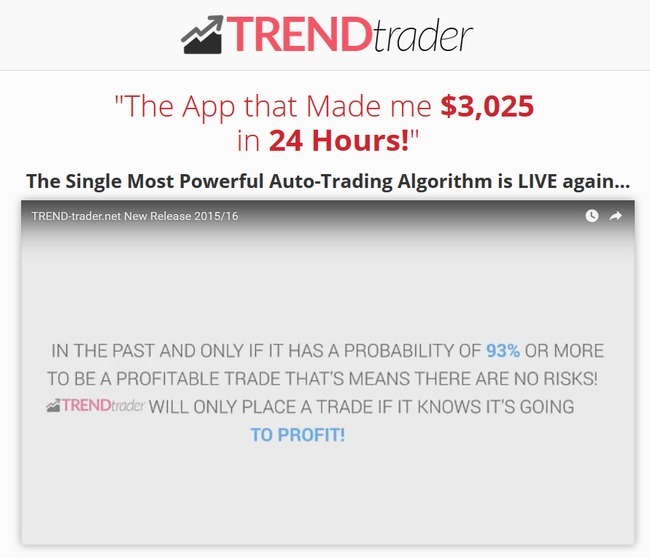 Even though Trendtrader quotes a specific daily profit of $3,025, there is no evidence to back this up. You will know why it’s not true in the later part of this review. Not only that, if you try to exit the sales page, you will be presented with a popup as shown here. 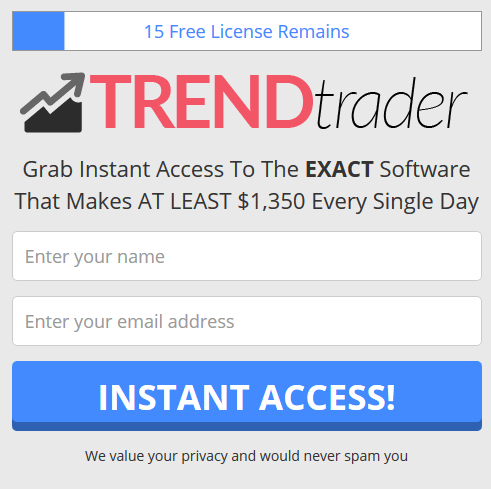 Notice how Trendtrader scam uses the scarcity tactic by showing that there are only 15 free licenses remain. If you visit the same page hours or days later, the same popup will appear, and there will still be 15 free licenses available. This is just a tactic widely used in online scams to retain leaving visitors. While these two red flags don’t necessarily establish that Trendtrader is a scam, they should raise some awareness given the questionable marketing tactics that Trendtrader uses to attract its potential victims. Read on to discover the truth that Trendtrader is trying to hide from you. Before we continue with the review, we want to talk about how binary trading works to make sure everyone is on the same page. If you have experience trading binary options, you may proceed to the next segment. Binary trading is basically trading stripped down to its simplest form. You don’t need to analyze complicated charts or keep up with financial news. You only guess if the price of an asset will rise or fall after a short period of time, usually between 30 seconds to minutes. This is how it works – Let’s say I guess that the price of gold market will rise 60 seconds from now, and I bet $50 on a 1-minute contract. When the time is up, and my guess is correct, I’ll win a certain percentage of what I bet, usually between 60% to 80% ($30 to $40). But if I’m wrong, I lose the entire $50 that I bet. In reality, trading binary options is not that different from gambling. It’s the same as guessing the outcome of a coin toss. The odds is almost at 50-50. There’s no way to predict the outcome of market movement in such a short period of time. In most cases, traders depend only on luck and gut feelings. It’s impossible to win consistently. And even if you manage a 50% win rate, you’ll still lose money due to the uneven winning vs losing payout of binary options. 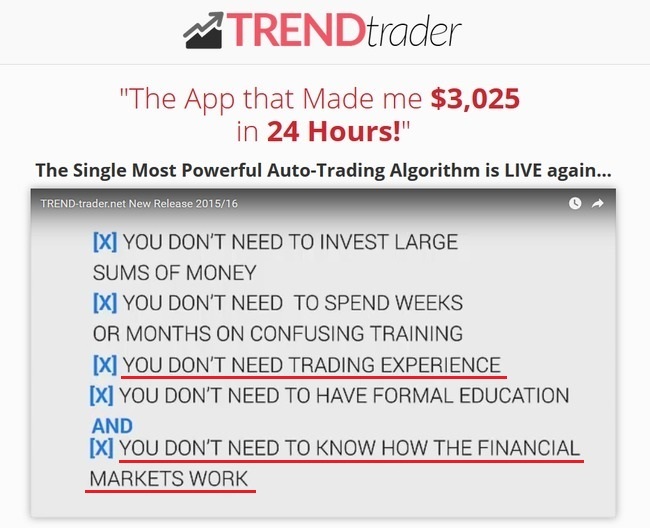 According to Jonathan Miller, the alleged owner of Trendtrader software, making money with Trendtrader is extremely simple because everything is automated. You don’t need any trading experience, nor the knowledge of how financial markets work. We underline these 2 points because Trendtrader scam is backing out on their own promises through specific terms inside their risk disclaimer. We’ll discuss that in details in the next segment. With that said, using Trendtrader is indeed exceedingly simple. You just have to sign up for a broker account, deposit a sum of money and activate Trendtrader automated trading software. While Trendtrader will trade for you automatically, it’s not risk-free, and it’s not guaranteed to make money as claimed in their sales materials. Despite promising you a risk-free and guaranteed money making software, Jonathan Miller and Trendtrader scam are saying otherwise in their risk disclaimer. The risk disclaimer document is linked using a fine print at the bottom of the sales page, but not many people will click into it and have a thorough read. It’s very hard to read with its fully capitalized letters and long sentences. Even though Trendtrader promises you at least $1,000 profit per day, you shouldn’t view it as a “get rich scheme”. That’s because scams like Trendtrader that promise exorbitant returns are illegal in many jurisdictions. Despite being a fully automated trading software, somehow your level of success with Trendtrader depends on your knowledge, techniques and various skills. Compare this term to what Trendtrader scam claims in their sales materials, and you’ll see how they try to escape from their irresponsible promises. The earnings and results shown in the sales materials are intended to express the scammers’ own OPINION of Trendtrader’s earning POTENTIAL. To put it simply, the trade results shown are not real! Despite boasting how Trendtrader only takes profitable trades, there’s no guarantee that you will achieve any results with the software. In fact, you are most likely going to lose all your deposits. Fact #3 alone should be enough to alert you and steer you away from Trendtrader scam. These terms and conditions are not here to give you a fair warning as a consumer. The sole purpose of this document is to protect the scammers from legal actions when you lose all your money trading with Trendtrader software. You can’t take any legal actions because you have accepted the terms as soon as you visit trend-trader.net. Let’s say you did not realize the red flags and decide to use Trendtrader software, you’ll have to sign up for a broker account via Trendtrader’s sales page (which is an affiliate link). Jonathon and the team behind Trendtrader scam will earn a sum of referral fees as soon as you make your first deposit. You may be assigned to a different broker depending on your country and location, but the typical minimum deposit is $250. Please take note that you can only use Trendtrader software with their recommended brokers. Even if you already have an account with their recommended broker, you have to register for a new one using a different email address. This is because the scammers behind Trendtrader cannot collect their referral fees unless you sign up for a trading account through their affiliate link. And what happens when you finally deposit the money and lose all your money using Trendtrader automated software? You are left on your own and you cannot take any legal actions against the scammers, because it is already stated in the disclaimer that using the software is your own decision. YES, TRENDTRADER IS A SCAM. As we’ve said in the review earlier, we don’t recommend binary options trading as a way to make money online, at all. It’s not that different from gambling, and using an automated trading software is no different. You are essentially putting your hopes and entire investment in a piece of software that gambles on your behalf.